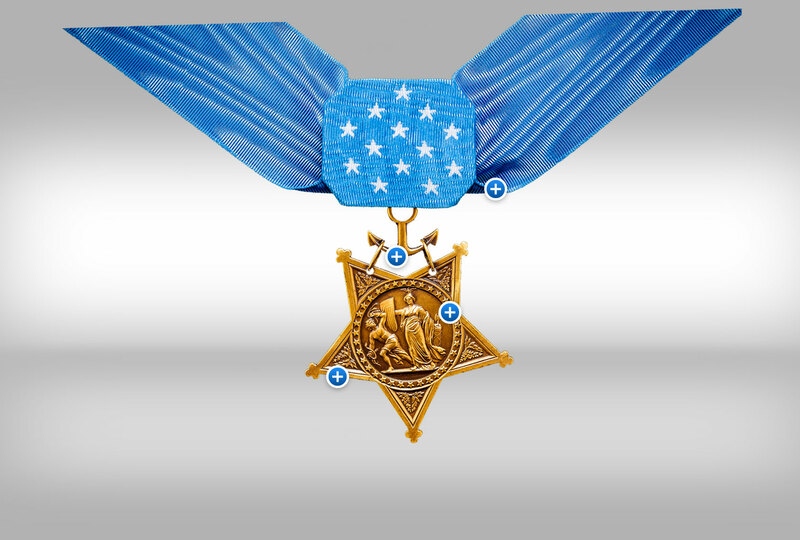 The Navy Medal was the first Medal of Honor, created at the request of Secretary of the Navy Gideon Welles. It has changed little since Christian Schuller of the Philadelphia firm of William Wilson & Sons designed it in 1862. Originally for enlisted men only, officers became eligible in 1915. The blue silk ribbon bears 13 stars, symbolic of the 13 original colonies. It was originally red, white and blue. The Navy Medal has changed very little since 1862. The anchor-shaped bail was originally wrapped in rope, changed in 1913. The inverted five-point star is surrounded by 34 stars, one for each of the states in 1862, including the Southern states that had joined the Confederacy. Each point of the star contains laurel leaves, for victory, and oak leaves, for strength. Called “Minerva Repelling Discord,” Roman goddess Minerva wears an owl, for wisdom, on her helmet. Her left hand holds rods and an ax for authority; her right hand, the shield of union. The man clutching snakes is “Discord,” an apt symbol for the chaos of the Civil War.